Feel free to come and watch a class to see first-hand what it is like and how it is taught. Please arrive in plenty of time, so that the teacher can introduce you to what you are about to see; and please make enough time to watch the whole lesson. There is a short break in the middle of the class during which, we will be happy to answer any questions about what you have seen and about the club in general. Ki Aikido is suitable for men and women of all ages, shapes, sizes and abilities. 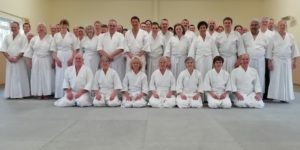 Whether you are a complete beginner, you have practiced something else before or are a visiting Ki Federation member, Derby Ki Aikido Club will make you welcome and teach you to your own level. All classes are taught by a qualified Ki Federation Teacher or Assistant Teacher. If you would like to find out more you are welcome to call Sensei Neil Shaw or alternatively get in touch with him by email. The postcode DE21 6YZ will take you to within 100 meters of the address but on the main road; from the main road look out for signs for Mason’s Place Business Park and turn into the set of gates highest up the road (there is a slight incline so this will make sense upon arrival – if travelling from the city centre.). Follow the road around the entry lane and you will see The Climbing Unit which is a large white and red unit directly in front of and next to Derby Brewing Company, continue along the frontage of The Climbing Unit and make a right at the end, you will see The Academy entrance at the foot of the slope. Sensei Neil Shaw has studied Ki Aikido as a member of the Ki Federation of Great Britain for 18 years. I have previously taught Ki Aikido to adults and Juniors for 15 years. I have practised Ki Aikido for over 20 years. I am now teaching in my local village of Stanley Common and currently enjoy teaching students aged from 5-13 years. If you would like to watch a class please arrive 5 minutes early. To ask questions please contact me in advance. Juniors are required to pay their insurance and membership before practising, slippers or flip flops should be worn for stepping onto and off the matt. loose clothing without zips would be suitable in the first instance. Sensei Taylor resides in Weymouth but teaches in Dorchester. He has studied Ki Aikido since 1973 and was awarded 6th Dan in 2012. Come along and experience what it is like first-hand. Aikido is far more about what is felt rather than what can be seen, so wear something comfortable and join in – IT’S FREE! No need for a judo suit to begin with. Also remember to remove all jewellery and keep toe and fingernails short or bind them with tape for safety’s sake. Lessons are structured so as to allow students of all abilities to practise together. The club welcomes students from outlying Dorset towns and villages as well as from Dorchester. The facilities are excellent and you will always be greeted with a smile.